style that flourished between 1890 and 1914—give or take—characterized by burnished yellow gold, soft enamel colors and undulating, curvy shapes. René Lalique was considered the master of Art Nouveau jewelry before he made the career move to glass. a gem that has a smooth rounded surface instead of being cut into facets. It gleams rather than sparkles. a circular headpiece with high arches that meet at the center, signifies the rank or ceremony of monarchy. Only a sovereign wears a crown, typically owns it too. The modern crown, as we see it, evolved from the modern-day coronet, popular in medieval times. Pictured below are two of the only surviving medieval crowns. The designs evolved to denote between the ranks of peerage. Many of the early European crowns were made in sections hinged together by long pins, which enabled them to be taken apart for transport or storage and, when worn, to adapt themselves to the shape and size of the wearer’s head. The practice of grounding the arches not on the rim of the circlet but on the tops of the surrounding ornaments began in the 17th century. This led to a change in shape and a flattening or depression in the center that has come to denote the wearer as having a royal or imperial significance. If you wanna get technical, we can compare these with Spanish and Austrian Nobility. And then we can do long division! this photograph of the Duchess of Alba predates the invention of the cotton gin. Oh and she’s wearing a ducal coronet. Another crown form in medieval England and abroad followed the principle of the wreath and might consist of a string of jewels tied at the back with a ribbon or set in a rigid band of gold. Specifically in 16th century Western Europe, a chaplet was akin to a wreath or garland of leaves and flowers worn upon the head, bestowed as a mark of honor or symbol of esteem. Often worn by first-time brides with their hair loose, in token of virginity. A chaplet of orange blossoms, sometimes enameled or jeweled, was traditional. A chaplet can also be wreath of twisted silk or satin made of an ornamental padded roll for any occasion. However, in recent film and TV fiction, it was worn by anachronistically for Christmas celebrations. I’m not arguing that it didn’t look adorable, it just wasn’t correct! Now we’re getting to the really debatable terminology. Let us remember that the “diadem vs. tiara” debate is pretty much what inspired this page to begin with! It does not seem like a distinction that can be made in pure physical characteristics. (Seriously!) The dictionary is hopelessly nebulous in its definition as well. (1) A royal headband (2) something that adorns like a crown. The origin of the word is a total Odyssey, what a trip! FROM: Middle English diademe, from Anglo-French, from Latin diadema, from Greek diadēma, from diadein to bind around, from dia- + dein to bind; akin to Sanskrit dāman rope First Known Use: 13th century. Oy vey! 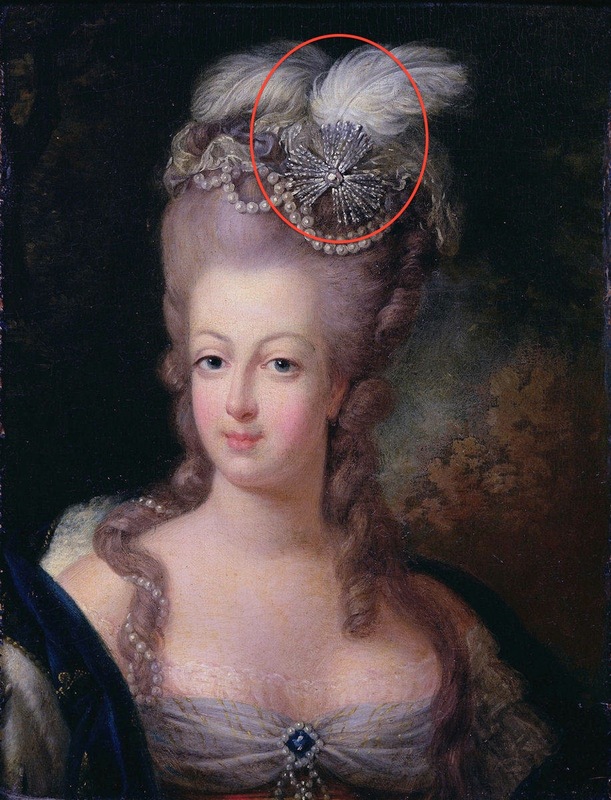 As this is the Internet, We’ve come across this speculation: a diadem denotes royalty while a tiara does not. Not true. George IV Diadem: we KNOW this one’s not a tiara. No grey area here! There are no definitive answers, conclusions or agreements. Personally, I’d liken a diadem more to a coronet; it encircles the head entirely while a tiara is usually tapered towards the edges, flexible, and fastens somehow. An imperfect circle. Mostly I see the word diadem used on auction websites to describe something that I’d call a dinky tiara. But you know they gotta sell sell sell. Tricky language, I don’t approve! I’ve also seen the term diadem used to denote to tiaras that are more grandiose than the average…but if the Queen Sofia’s Tiara, the Luxemburg Empire Tiara and the Noor-ol-Ain are tiaras, then I discard that usage as well. Meanwhile, Merriam-Webster defines. form of glass that when heated to a certain temperature, forms a liquid that can be applied to different metals. think: the Chamuet Blue Kokoshnik. See left for detail. Festoon necklaces are commonly identified by a necklace that has many different drops with varying motifs as well as chains that loop throughout the necklace. The nefarious Affair of the Necklace was one of these! Trippy! While that one was dismantled, the style became popular during the Art Nouveau Era. technique of attaching thin pieces of metal together to create very intricate patterns. Later a casting method was perfected allowing for light, airy designs. Very popular during the 1920s and 30s. a specific pattern motif (see right) who took its name from the river Meander, a river with many twists, mentioned by Homer in Iliad. The motif is also known as Greek key or Greek fret. a metal setting for stones decorated with tiny, raised beads. Especially popular in the early 20th century. not the kind you used to sniff in art class cos you were too stupid to know that it’s supposed to be rubber cement. Rather pieces of glass cut & colored look like gems. This form of imitation began in the 17th Century. This is one of those terms you hear more in Britain & other points east of the US. Your Blog Hostess hadn’t heard of it before she began her hostessing. not the hipster kind, thankfully. don’t get me started…a style made popular by the Duchess of Windsor. This bold, solid look was popular in the 1940s & 50s, with big wavy lines and large stones. Rubies and aquamarines were en vogue. Often set into rose gold. VanCleef & Arpels were power-hitters with this. as follows: a decorative jeweled or flowered headband or semicircle for formal wear by women. Sorry Merriam-Webster, but a flowered headband is a chaplet! See above! clockwise from top left, duchess of cambridge halo scroll; Queen Alexandra’s Diamond Kokoshnik, Princess Anne in the Aquamarine Pineflower, Princess Maragaret in the Poltimore, Crown Princess Marie Chantal in Queen Frederika’s, Queen Sonja in Josésphine’s Emeralds, the Luxemburg Empire Tiara, Crown Princess Metit Marit in the Diamond Daisy and Letizia, Princess of Austurias in the Prussian Diamond. Okay, can you tell how much fun I had making the “tiara montage?” The “front or top of the head “debate is moot in my mind; where in your hair-do the tiara is placed is not a defining characteristic, it’s a style that goes with the times. Check out the Empress Joséphine Emerald Tiara as it has been worn over time. Most tiaras I can think of tend to taper, even if just slightly like the Cameo Tiara, and usually peak in the front, one way or another. Maybe it climbs like a pyramid, maybe it just has a nifty center stone. Many tiaras are hinged and flexible, convertible and combinable. Some double as necklaces. A tiara can accommodate all girths of heads, happy now, you human lollipop? (I can say this because my I am one of those Lollipops. My head looks oddly disproportionate to the rest of me. I come from a family of big heads, apparently. check out Our most popular category, Tiara Time! I guess the circlet is a tiara that goes all the way around (or gosh-darn near all the way around) the head. Typically the width doesn’t vary. Perhaps we should chalk this up to another tiara synonym like bandeau. a bejeweled headband or headband-style tiara. (Well, that’s a bit repetitive, isn’t it?) Bandeaus are typically rather low in height and without as much “vertical ornamentation” on the top or the characteristic peak in front as a cut-and-dry tiara. I immediately think of the Diamond Daisy Tiara (see above, “Wedding Tiaras”) but I rarely see it billed as a bandeau. Strange…see what I mean about grey area? Grand Duchess Marie Feodorovna’s Diamond and Sapphire Bandeau Tiara, bought by–who else but the queen irreproachable in the spheres of tiara-parure bon viveur, Mary of Teck. Queen Mary’s Diamond Bandeau that really never became a bandeau until Princess Anne pared it back to 60s (?) cool by removing the inverted, upright pearls that just looked like uptight question marks on a princess who stode the sidewalks in mini-skirts. The kokoshnik (Russian: кокошник) is, for our purposes, a tiara that has the shape and style of the traditional Russian kokoshnik, a peasant headdress worn by women and girls for centuries. But, since I love to beat a dead horse, heck, we’ll do both! The traditional kokoshnik was typically patterned to match the style of the sarafan and can be pointed or round. It is tied at the back of the head with long thick ribbons in a large bow, hair worn in a braid. It resembles the French hood worn in Tudor England, but without the veil. Until the time of Peter the Great, it was worn only by girls and unmarried women, sans veil, braided hair on display. Conversely, married women wore a different version that covered all their hair and they also wore it with a veil underneath or a headscarf over this type of kokoshnik. This distinction survived in peasant communities until the Revolution. During the revival of Russian national culture in the early 19th century, an adapted kokoshnik became part of the official court dress for royalty and ladies-in-waiting. (This is why we have kokoshnik tiaras today, kids!) Adapted for Imperial glamour, gilded, gem-encrusted, this time, the variety used traditionally by unmarried women was worn by both unmarried and married women, showing the front part of the hair, with a translucent veil falling down the back. REVEALED! : the missing like betwixt the “tiaras” and the “Trianon” that makes this blog’s theme a bit bipolar. a tuft of long, white heron (usually egret) plumes used as a decorative headdress, or any other ornament resembling such a headdress. Such plumes were highly prized as ornaments in Middle Eastern ceremonial dress. Jeweled aigrettes, at first made in the form of a tuft of plumes, became an adornment for turbans in Turkey, particularly during the Ottoman period (1281–1924). Jeweled aigrettes were listed in royal collections at the end of the 16th and the beginning of the 17th centuries. During the 18th century, they were popular with fashionable European women, who wore them pinned in their hair to hold masses of curls at the back of the head. Nowadays, the remaining aigrettes are worn without their feathers, probably because (1) feathers are so 18th Century and (2) they are REALLY flammable and who needs that? 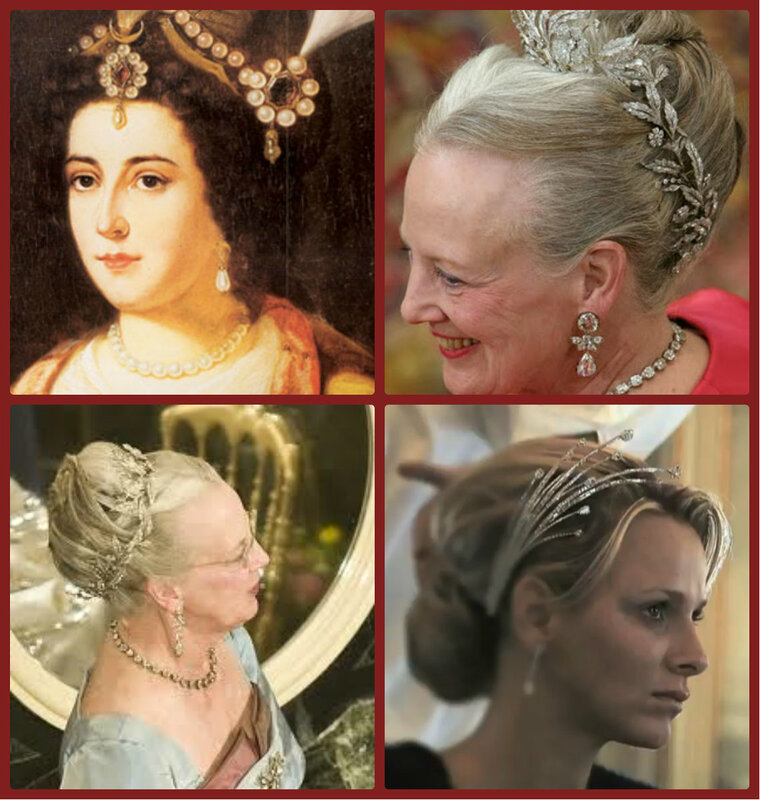 The term can sometimes be used to refer to other sorts of flexible ornaments for the hair (Queen Margrethe has a Floral Aigrette Tiara, for example). aigrette, (clockwise from top-left) Tsarina Catherine the Great, Queen Margarethe ii of Denmark, Princess Charlene of Monaco in her wedding gift tiara. Aigrette posts, click here! Okay, more Aigrette posts are coming, I promise! Merriam-Webster defines revière as “a necklace of precious stones, such as diamonds or other gems.” Dictionary.com agrees but adds the caveat “especially in more than one strand.” Interesting. In describing various jewel-mounting techniques, Britannica.com finely hones the definition. “A tendency to leave the stones as visible as possible (especially in rivière necklaces and bracelets made only of diamonds) by mounting them with a very small ring of white gold or platinum fitted closely against the back of the stone.” Ergo the dictionary specifications of diamonds or other precious stones. Obviously, the word comes from French, meaning literally “river” from the Old French rivere. Rushing currents of gemstones filling a riverbank…sounds heavenly, especially during flood season, n’est-ce pas? the Leutchenberg Sapphire Parure with earrings, necklace, tiara and hairpins–yes, eat it, hairpins! The use of the word parure (“adorno” in Spanish and “aderezo” in French) began in the seventeenth century to refer to three or more pieces of jewellery that matched, just when this style was popular. By the mid-17th century, jewels had ceased to be created as individual works of art expressing some idea or fancy and had instead become mere personal ornaments that were beautiful but lacking in any deeper significance. Consequently, as the forms of jewels tended to become stereotyped, the matching set of jewels, or parure, became the dominant style in jewelry. In the Seventeenth century, parures consisted of earrings, a brooch, necklace or clasp, ring, and sometimes shoulder brooches or buckles, all set with diamonds, either alone or in combination with rubies, topazes, sapphires, emeralds, basically any gemstone. In the 18th century the Kings of France had parures that were borderline ostentatious, made mostly of diamonds, the pieces including shoe buckles, coat decorations, insignia, and sword hilts. popular headgear in Tudor England and France with a veil or snood attached to the back. It is distinguished from the English hood by it’s rounded, “crescent moon” appearance. In some ways it is similar to a kokoshnik but they are unrelated. (alright, let’s all take a moment to snicker at the fact that this is indeed a word…snood!) The dictionary offers four definitions, two of which are pertinent to us. The snood was a net that contained hair, much like a modern snood, the difference was that back in the 16th century these snoods would be (as previously mentioned) attached to the back of the head, French hood, etc. It would contain hair very tightly on some occasions, although it is known that some snoods allowed some hair to break free. Popular during the first half of the century, snoods were mostly worn in England and France with the French hood. Sometimes the snoods or snood bag would be attached or plastered on the back of the hood. In some place like Spain and Italy, snoods would be worn as a simple net without any headress. the must have of all fine ladies everywhere! Also known as a train-case, dressing case…make-up bag. And boy do they do NOT make ’em like they used to! merçi buckets for your appreciation of this [still incomplete] list that took forever! I’m such a perfectionist to the point of exhaustion so I kept finding more things to add. If I didn’t post it as s a work in progress it would still be just a lonely draft!